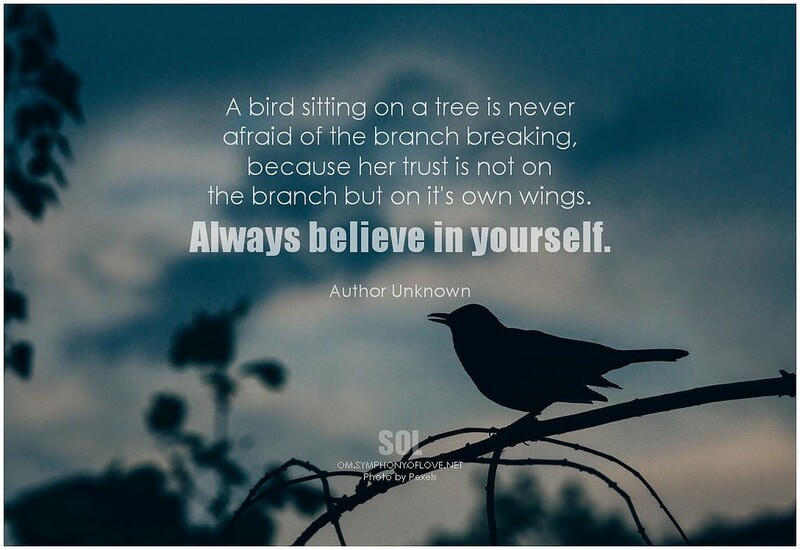 Have you ever watched a bird land on a slender branch and wondered how in the world the bird knew that branch wouldn’t break beneath its weight? I’ve seen birds land on a branch that bent so much, I was sure the branch would break. Or maybe suddenly bounce back up and catapult the bird into the air. But the bird didn’t seem afraid at all. It often made me wonder how it knew. Had it landed there before? Could it gauge the size of branches? Did another bird “tell” it that branch was safe? The quote above reveals the mystery of this phenomenon. Birds don’t trust the strength of the branch they’re sitting on they trust their wings. Birds can land on fragile branches, thin electrical wires, or even a clothesline. They can take those risks without a care in the world. Without fear. But it’s not because they know all there is to know about the branch itself or they have some kind of gauge for branches. It’s not because another bird “told” them that branch was safe. It’s because birds trust their wings. If the branch bends or breaks, birds can use their wings to take flight without falling to their demise. To alter their course without injury. Now apply this to being a writer. Fear is a common obstacle for many writers. Fear holds writers back. In some cases writers even fear success. Fear stops writers from going where we want to go with our writing. For writers the muse is our wings. Our muse can give us the confidence to take flight before we crash. To write without editing as we go. As we strengthen our trust in our muse we can soar to new heights and explore scary places with our writing. If we learn to trust our muse to be our wings, we can go wherever we want with our writing. Without fear. Trust in your muse inspires the confidence to put fingers to keyboard AND hit the share button to send our writing out to the world so it can soar. Give your muse a name and a personality. Whether your muse is a Shy Sally, Petulant Peter, or Whimsical Whitney, get to know your muse. Develop that relationship. Whatever it takes. Learn to trust your muse. Like a bird trusts its wings. And watch your writing soar like never before.